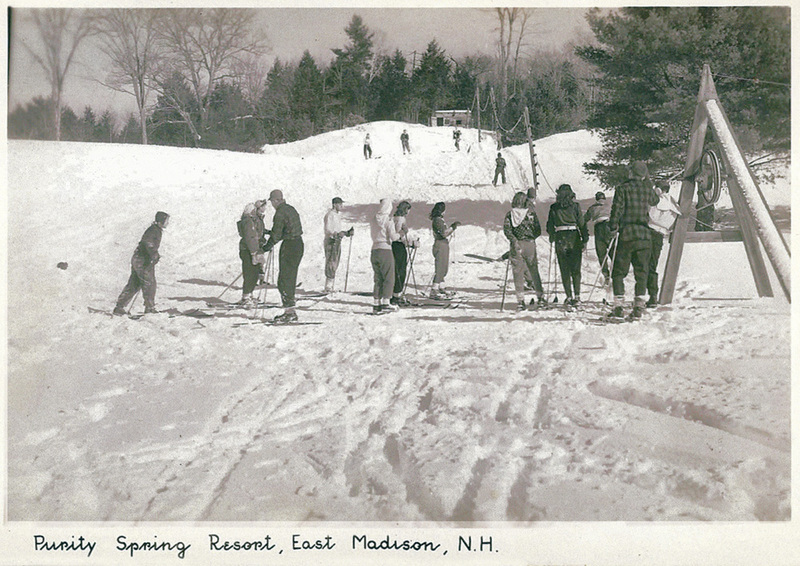 Prior to King Pine, the Purity Springs Resort operated 4 rope tows at various locations throughout their resort, from 1938-1962. The tows operated until 1962, and closed the year that King Pine opened (there was one overlap year). Thanks to Dan Houde from Purity Spring who sent us the following information on these tows. All photos are courtesy of Purity Spring, and click on each for larger version. 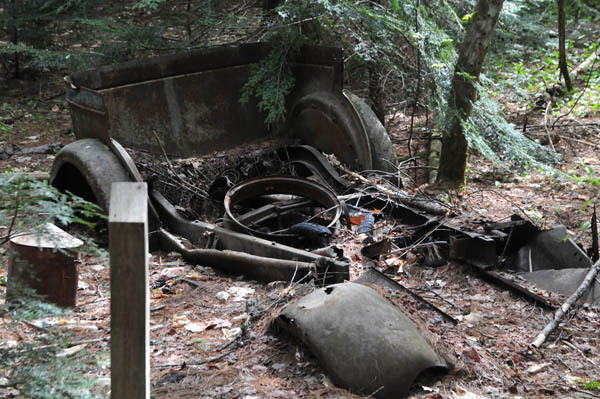 There were rope tows used at Purity Spring in East Madison, NH (behind the property's main lodging building called "The Inn" at Purity Spring) which began in 1938 (the first tow was powered by the summer work truck, a Model A on stands). 4 tows were in operation from in the years between 1938 and 1962. Most of the early tows were operated by Model A trucks which were work trucks for the resort. The trucks were tied off to trees to keep them in place and 1 rear tire was blocked to prevent from spinning. The other rear tire was removed and the rim acted as the pulley. Skiing was mainly for lodging guests over the year but family and friends were also invited to ski the trails. There are still some signs of the lifts in places on the hills. There are nordic trails in those areas now as well. 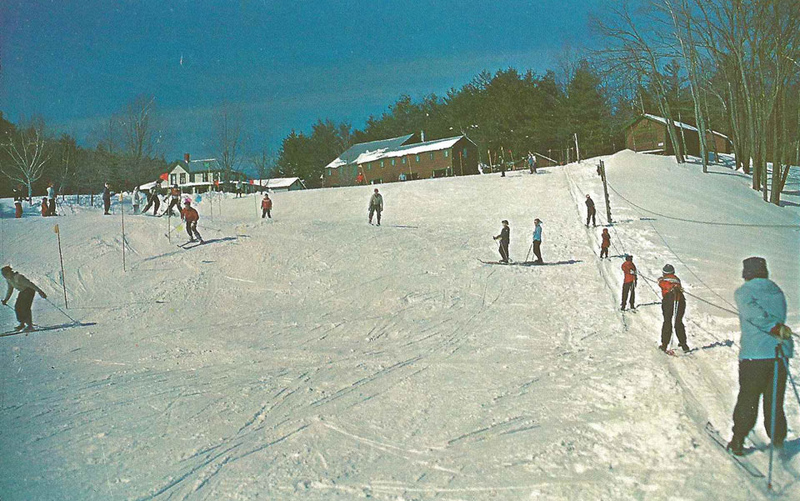 There is one photo attached that shows the "Bald Ledge Tow" which was the first one at Purity Spring. There are 2 pulleys that still remain on the trees or poles (don't have that photo yet). I learned when reading over some journal entries that the Purity tows overlapped with King Pine during its first year (1962). Apparently they made the decision to keep the rope tow going one more year specifically for Purity guests while King Pine was opened to the public down the road. I assume that that ended quickly the following season. Left - one of the tows. Camp Tohkomeupog is the boys summer camp which began at purity Spring in the early 30's. Many of the same students were invited back during the holiday breaks to learn to ski on Purity's trails. 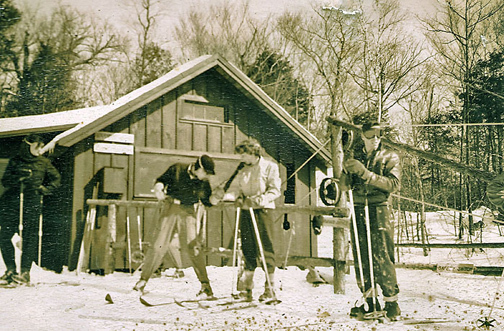 This grew into a tradition that continues today - Ski & Snowboard Camp - which appears to be the longest running ski camp in the country. Right - another tow. Resort in the background. Signs of the other tows are gone although the photo on the left of an old truck may be one of the drives at one point but is nearly impossible to confirm unfortunately. If you remember this area and have more information, please let us know.